Today I want to write about an amazing looking bird, the Luzon bleeding-heart. These beautiful little birds are a member of the pigeon family and grow to about 28 cm long. 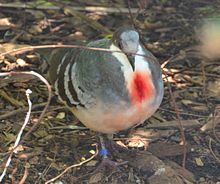 Luzon bleeding-hearts get their name from the mark on their chest feathers that makes them look as though they are bleeding. They spend most of their time on the ground, feeding on seeds, fruit, insects and snails. At breeding time, they lay 2 eggs in nests made low to the ground. Like other pigeons, they feed the newly hatched chicks crop milk for the first few days of their life. Luzon bleeding-hearts are found on the island of Luzon in the Philippines. Their numbers are dropping due to loss of forests and poaching for the pet trade. Are there any other interesting facts that you would like to share about Luzon bleeding-hearts?